The Paperboy's Archive: "Hummm... Baby," The Thrill and One Flap Down... Immediately Followed by "Dude, Where's Our Car?" "Hummm... Baby," The Thrill and One Flap Down... Immediately Followed by "Dude, Where's Our Car?" WILL "THE THRILL" CLARK never made baseball's Hall of Fame. Neither did Jeffrey Leonard, he of the notorious home run trot, "one flap down." But those men, a white southerner and black northerner who openly clashed with each other in 1987 made the San Francisco Giants into a team to be reckoned with. Humm, baby. Humm, baby? Yes. Humm, baby. It had been 16 years since the Giants made the post season, a quarter century since their last World Series appearance, a seven-game loss to the New York Yankees. 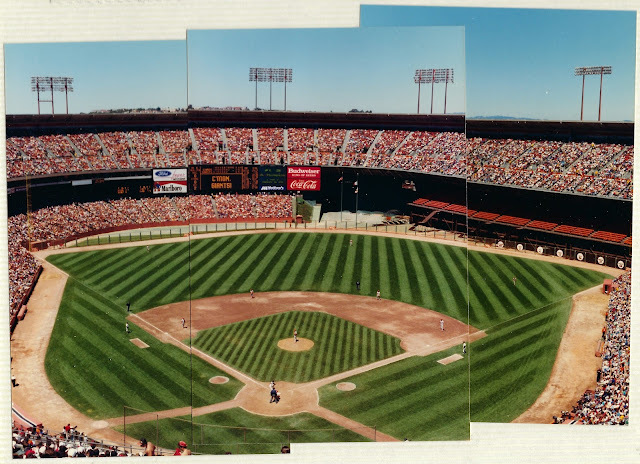 Despite the presence, at various times, of Willie Mays and Willie McCovey, of Garry Maddox and Gary Matthews, of Dave Kingman, of Bobby Bonds then Bobby Murcer, of John Montefusco and Vida Blue, the Giants had long languished in baseball's shadows. Across San Francisco Bay, the Oakland A's had a string of five straight playoff appearances and three consecutive championships. Within the National League West, the Giants had been totally eclipsed by the long-time rival Los Angeles Dodgers and the Cincinnati Reds. In fact, every NL West team had finished first at least once since the San Franciscans had last managed the feat: the Reds in '72, '73, '75, '76 and '79, the Dodgers in '74, '77, 78, '81,'83 and '85, the Houston Astros in '80 and '86, the Atlanta Braves in '82 and the San Diego Padres in '84. The title merry-go-round was spinning and the Giants weren't on it. Change came midway through the disastrous 1985 season when a 62-100 record landed them in the NL West basement. After 144 games, they fired manager Jim Davenport and hired sagacious Roger Craig. The pitching anchor of the original and terrible New York Mets, Craig suffered through back-to-back 20-loss campaigns. He knew about adversity. His approach: stay positive. At spring training 1986, he called journeyman catcher Brad Gulden "humm baby," for still giving 110 percent effort in a career nearing its end. According to legend, the phrase was a contraction and corruption of the sandlot shout of encouragement, "C'mon, baby!" 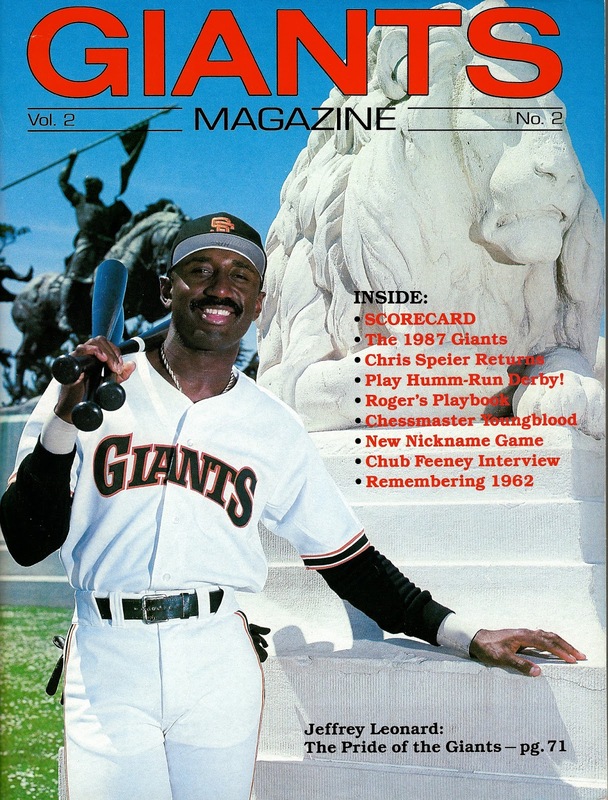 By 1987, the Giants had a team full of humm babies led by the veteran outfielder Leonard, 31, and Clark, 23, who'd starred at Mississippi State and -- as the Giants were bottoming out in '85 -- won the Golden Spikes Award as the best amateur ballplayer in America. By July 26, though just one game over .500, the 49-48 Giants trailed the first place Reds by just a single game. 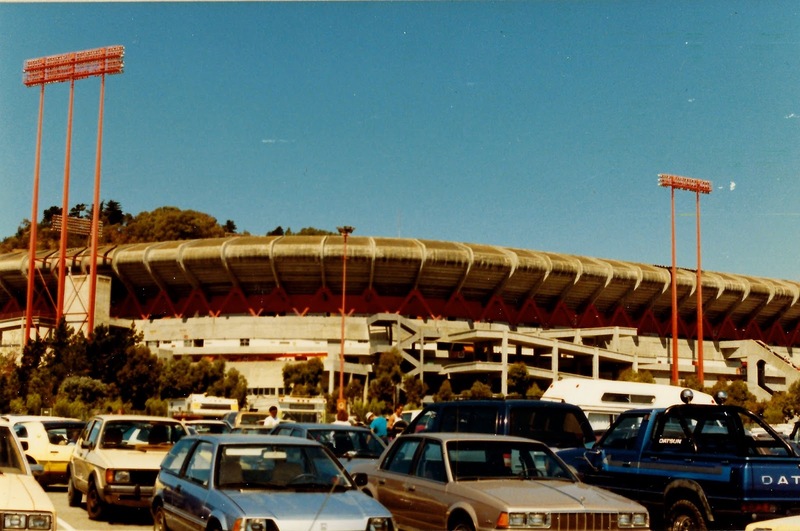 On that day's schedule: a double-header with the NL East-leading St. Louis Cardinals at windswept Candlestick Park. They were about to ignite. Rallying back from a blown 2-1 lead, the Giants took the opener in 10 innings on a walk-off, three-run homer by The Thrill. Then, though the Cards struck first in game two, they were decked, 5-2, with Clark clubbing his second round-tripper of the afternoon. From there, the team went 39-24, overtaking the Reds by six games to win the West. Awaiting them in the NL Championship Series: the Cardinals. Now it was Jeffrey Leonard's turn to shine. The Pride of the Giants, until he wasn't. Leonard, like Clark, was blunt-spoken. If you liked it, fine. If not? Too bad. The Cardinals were not fans. The St. Louis fans were not fans. Over the 7-game series, the Giants outfielder torched Cardinals pitchers for four home runs, each punctuated by a somewhat leisurely tour of the bases, his left arm at times deliberately slack at his side. One Flap Down, again and again and again. For the series, Leonard batted .417 with 10 hits in 24 at bats, including those round-trippers. He walked three times, scored five runs and drove in five. While Leonard's efforts earned him series most valuable player honors, it wasn't enough to carry the Giants past the Cards. They lost in seven games. In mid June of the next season, he was traded to the Milwaukee Brewers for utility man Ernie Riles. Clark would lead the Giants to the pennant in 1989, where they were swept by the A's in a series mostly remembered for the magnitude 6.9 earthquake that interrupted it. Leonard, by then, had migrated to the Seattle Mariners, but the former teammates' enmity remained. Long since retired, both men have found other causes for which to fight. Leonard and his wife Karen founded the One Flap Down charity, now known as One Fabulous Day, dedicated to helping single parents battling cancer. Clark and his wife Lisa are combatting autism. The Giants finally won the series in 2010 and again in 2012 and 2014. 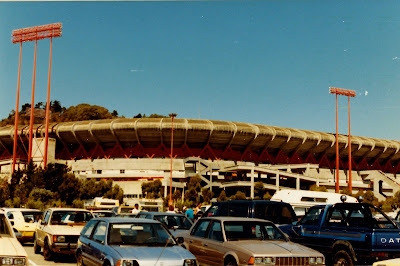 That first game of the July 26 twin-bill was the third stop on my 1987 California/ballpark tour. Me and my pal, photographer Chris Stanley, had been running at breakneck speed, seeing everything we could see in between scheduled ballgames. This day was no exception. We arrived at the 'stick just before game time and after Will thrilled, we left, only to realize we'd no idea where we'd parked. With most attendees staying put for game two, we roamed the wind-swept asphalt for 45 minutes, searching for our rental car, a gold Chevrolet Corsica. Turned out Captain Kirk was right. In the Summer of 1987, soon after graduating from college, me and my buddy Chris took a baseball tour of California. Mostly baseball at least, and hell of a good time. This is the fourth part of a series inspired by those 16 days on the road.